Episode 681: Could He Talk? Perhaps the few months of silence that Quentin endured gave me a chance to get acquainted with him. The fun an actor gets to have when creating a character. While in Illinois I discovered an Edgar Lee Masters poem, Silence. I rediscovered it when conjuring Quentin. Silence was my bridge to Quentin. So, I cautiously approached Quentin — trying to learn what he was, who he was, what he wanted, what he desired, what he was seeking, what he was curious about, angry about. He could walk into a situation and know who was his enemy, who was a fool. He could be much smarter, much more charming, more ruthless than I ever could be. He liked brandy. He could be self-deceptive, vain (check the pompadour), foolish, hyper, lonely, ridiculous, macho (where was Gloria Steinem when they needed her), and he was inflicted with a false confidence. But first, would he, could he talk? So that’s the question on the table this week. The restless spirit of angry ancestor Quentin Collins has been skulking around the great estate for two months now, ever since that strange little orphan girl found the antique telephone with a direct hotline to the dead. So far, Quentin has been quietly coaching from the sidelines, more mime than man. And frankly, I haven’t been super impressed with the storyline so far, which kicked off with some top-shelf attempted patricide and then cooled considerably. The rare glimpses of Quentin in action have been thrilling, but I like my stories fast and furious, and a lot of the time, we’ve been watching eleven-year-olds just stand around and fret. 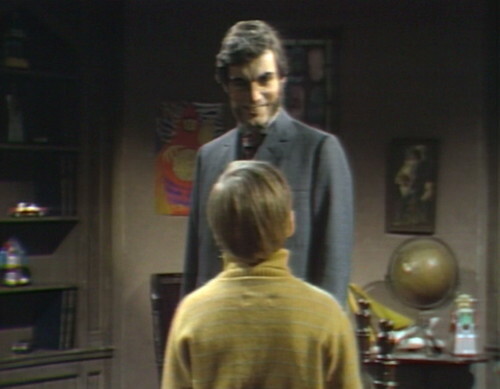 Considering the intensity of my Quentin-related fanboy feels, it’s about time we get around to the moment when I finally acknowledge that, okay, this Quentin storyline is getting good, so that’s what we’re going to do. Not today, obviously. Today is mostly tedious. But sometime this week. 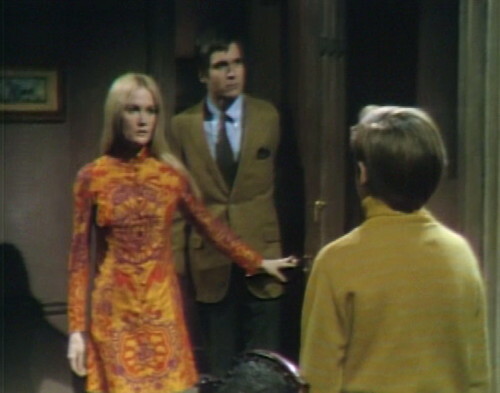 Friday’s episode ended with governess Maggie Evans snooping around in the west wing of Collinwood, which is supposed to be deserted but gets a surprising amount of foot traffic. Maggie knows that something’s up with young David, and she needs to understand why he’s been sneaking off to the west wing. Naturally, like all governesses, Maggie is heavy on the “I’m going to get to the bottom of this” and light on the actually knowing what to do when she gets there. 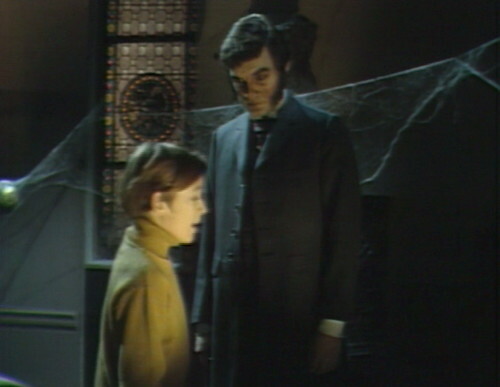 When she opens the door and finds a strange man in a frock coat glaring at her, she stands there and shrieks her head off, and that’s your Friday cliffhanger, all wrapped up in a bow. Picking up where they left off, Monday starts with Maggie still standing there with her mouth open. Quentin is staring at her, clearly wondering why the hell she even bothered to open the door if she’s just going to stare at him like that. Meanwhile, Maggie’s brain is sending nothing but Abort, Retry, Fail? messages. Finally, Quentin takes a single step towards her, in the manner that you would if you saw a deer on your front lawn and you wanted it to get away from your hydrangeas. You’re not actually planning to chase the deer or anything, you’re just trying to trigger the flight response. It works — Maggie turns and runs — and Quentin just smiles. And that’s pretty much the only thing that happens for this entire episode. Some days, you peak early. So Maggie runs downstairs, babbling about a strange man in the west wing, and you can pretty much tell from the blocking of this shot exactly how the rest of the episode is going to go. This is not a “call to arms” moment, where Maggie says “strange white man in the attic” and everybody else leaps into action, storming off to the western frontier with a blunderbuss and a butterfly net. 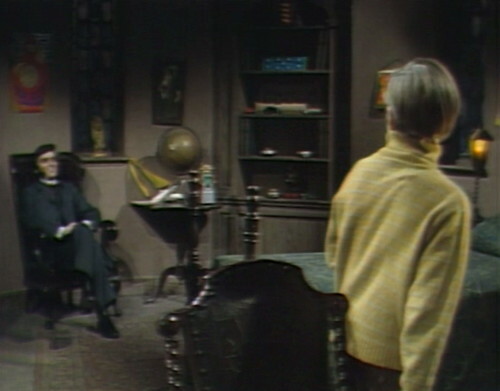 Instead, the other characters arrange themselves around the room in a tableau of vague puzzlement. At this point, anybody with a functioning sense of televisual literacy knows what this episode is about, even if you didn’t see the episode three weeks ago when exactly the same thing happened to Mrs. Johnson. It’s one of those “you’ve got to believe me!” type scenarios, where nobody does. So the rest of the day is pretty much pro forma. 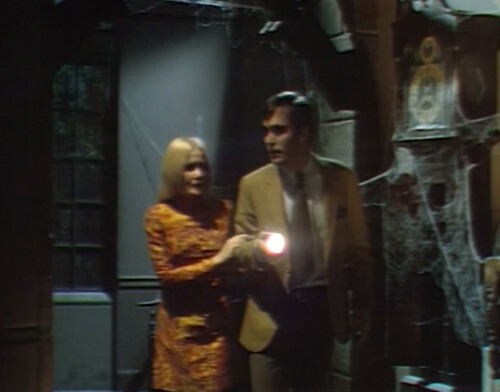 Chris and Carolyn go to cobweb central and poke around with a flashlight for a while. Maggie stays in the drawing room over-explaining everything and getting increasingly worked up. Chris and Carolyn go back downstairs and report that they didn’t see anything, big surprise. Then it’s Maggie and Liz’s turn to go to the west wing, this time bringing David along as bait. Chris and Carolyn stay downstairs and share some puzzled dialogue. Maggie insists that they’ll find something dreadful in the west wing, and they don’t. This is how the “you’ve got to believe me” sequences always end. It turns out they don’t got to. And, as I say, this is incredibly obvious after the first ten seconds, because it’s Monday and we’ve watched television before. “Oh my god there’s a strange man” was big enough to close a Friday. It’s not going to escalate any higher than that midway through Monday. But there is a nice Quentin moment, which sets up some of the developments later on in the week. It starts with David in his bedroom with the dearly departed, just catching up on current events. 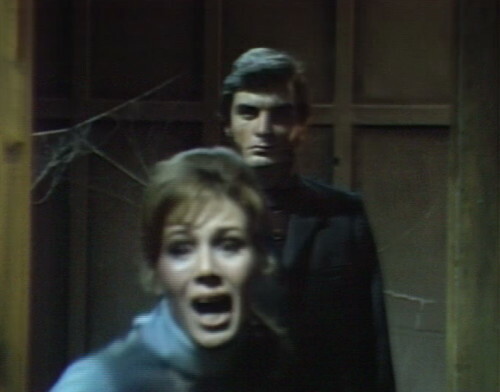 Suddenly, Carolyn and Chris open the door, and they pose for a half-second with their sight lines clearly targeting the space where Quentin is standing. 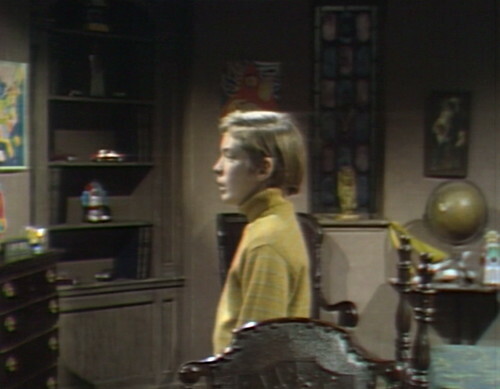 But David is alone, of course, and Chris and Carolyn were simply staring at a specific patch of empty space, as anybody would upon entering a room. This is a standard “you’ve got to believe me” style fake-out, because it’s a Monday and that’s the best we can offer. So then there’s a little scene where David says something innocent, and Chris and Carolyn chuckle, and ruffle his hair, and they give him a shiny nickel to buy licorice hoops at the general store. Or something like that, I don’t really pay attention to these kinds of scenes. They probably tell him it’s time for bed. People say that a lot on Mondays. 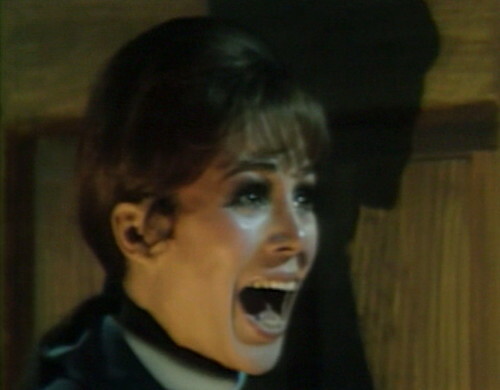 Once the hayseeds have cleared the room, David turns to the camera and does a spooky kid riff for a second. And then he turns, and Quentin’s just sitting there in the armchair, smiling, because Quentin is always there, even when the rubes can’t see him. This is actually a big step for Quentin, because until now, the kids have always made a big deal about going to see Quentin in the storage room. They’ve had multiple conversations on the theme of If we’re not allowed to go to the west wing, how will we contact Quentin?, because he was tied to a specific spot in the house. But he appeared in the drawing room the other day, and now we’ve got a clear message that Quentin is always nearby, watching and smiling and scheming. It’s not much in the way of story progression, but it’s setting up developments later in the week, and that’s something. The dead are still silent, but only for now. Keep listening. When Maggie opens the door to the storage room at the end of the teaser, you can clearly see Quentin standing there staring at her. Then they cut away to the other side, so that Maggie can scream before the official reveal of Quentin standing there staring at her. Just after Maggie and Liz sit on the couch in the drawing room, the camera swings wide as it tracks them. The rolling end credits are crooked. You can get a copy of David Selby’s memoir My Shadowed Past at his website, Davidselby.com. It’s dreamy and rambling and warm and completely loveable, 135 pages of impressions and reflections about that extraordinary year when he went from struggling actor to having his own trading card set. He personalizes every copy with a signature. It is a beautiful thing. 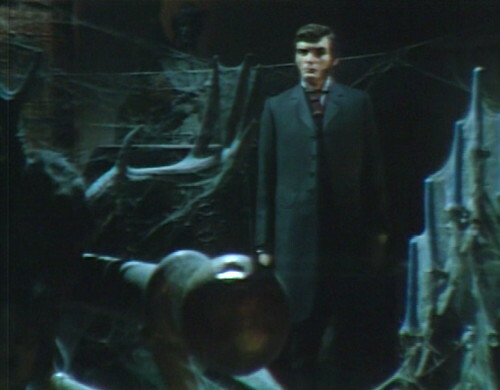 The clothes-dummy fake that David and Quentin use to gaslight Maggie is named “Mr. Jughans,” a reference to boom mic operator Max Jughans. “Mr. Jughans, keep it up” may be a joke on Jughans’ struggles to keep the mic from drooping into the frame. 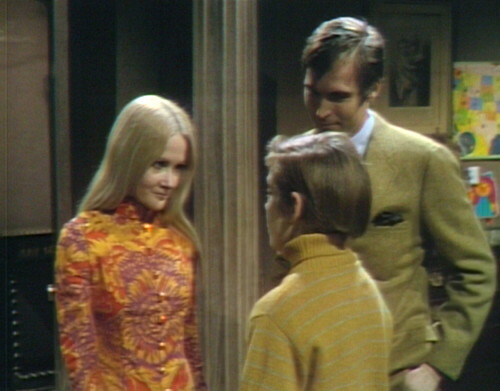 Carolyn’s outfit maybe the best ’60s garb that ever appeared on the show. It’s a great outfit, a psychedelic paisley acid trip. I feel the same way about the bright green sweater she wore with the silver bracelet the night she was attacked by the werewolf. That, with her long, straight blonde hair, was such a 60’s look. Bright greens, moss greens, green was huge in the late 60’s. Maybe even the highlight of the episode for me. I grow weary of the silent ghost. 1897 can’t get here fast enough. I suppose it’s worth the wait, because 1897 is the golden age of DS for me. Did anyone else ever get the sense that Carolyn resented Maggie living in the house as governess. Maybe because Maggie ‘stole’ Joe when he got tired and embarrassed with having to watch Carolyn’s outrageous public pursuit of Burke Devlin. There’s just something ‘not right’ there. Carolyn and Vicki became friends and spiritual sisters but Maggie is definitely ‘hired help’ in Carolyn’s eyes. By the time Maggie became governess, the show was on a totally different trajectory. It didn’t have time to develop a Carolyn and Maggie relationship — there were too many monsters & supernatural storylines to construct. 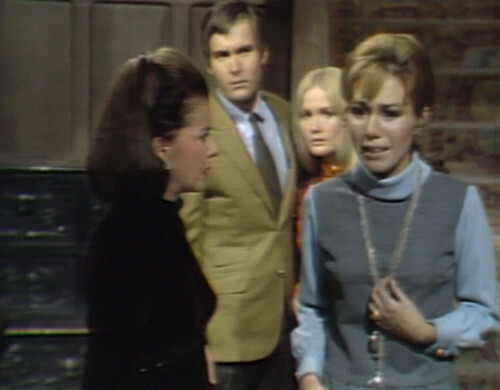 Before Barnabas arrived, DS had plenty of time for Vicki and Carolyn to discuss their ‘feelings’. Even back then however, Vicki’s persona seemed to limit the depth of any relationships. But at least, she smiled sometimes. And we liked her smile. Not at the end so much, if at all. So now you’re actually doing comment haiku? (Snort!) No, but that’s a great name for a band, too. True – but this relationship seemed glaringly tense to me. Carolyn is ‘very snippy’ on several occasions with Maggie. But I love Nancy Barrett’s fury, anytime. Even the snippy is good. Two furies come to mind….her and Adam at the cave when he repeats her every word and her screaming reply……and in the drawing room with Willie, who doesn’t believe that Carolyn knows where Ron Sproat has Maggie locked up this time. She really gives it to him before she recites the riddle. Oh, for sixes and sevens…..
Crap, it’s not a cave, it’s a what? And I think that drawing room scene with Willie doesn’t happen until Jeb dies at least, so I jumped the gun, but it’s my favorite, dammit. Where the north path grows narrow, you’ll be at sixes and sevens. Find the H and follow the arrow that points to Maggie Evans! Honestly, I don’t recall that many scenes with Carolyn and Maggie the governess to really get a feel for their relationship. I’d go one step further–not only wasn’t there TIME to develop a relationship, there wasn’t any INTEREST. As you suggest, this show isn’t about relationships anymore. And I think the riddle scene is in the Claude North Era. I liked the bit when Maggy says that the man she saw was the same one Mrs Johnson saw in the cottage. Liz replies that Mrs Johnson didn’t say anything to her about it. 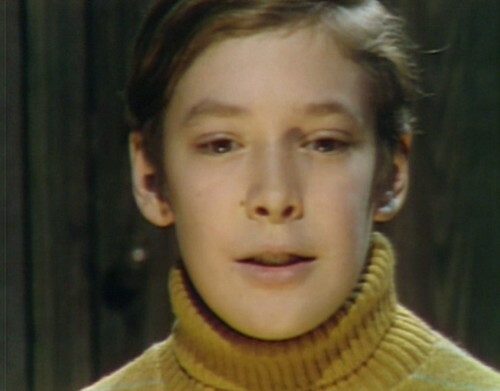 The intro for this episode describes the children as ‘carefree and innocent’. When was that? Amy, perhaps, innocent, but neither of the children have ever been carefree as far as we’ve seen. Maybe they’re totally different when they’re not onscreen, full of whimsy and delight? I wonder how many scenes in DS had a character directly addressing the audience? Because it seems like David did this with his little recitation of the “Dr. Fell” doggerel. Breaking the fourth wall in an attempt to enlist the audience as co-conspirators in his “weird kid” schemes?